As much as it might seem that he took a long time to paint - he really didn't at all. I just had a lot of breaks between painting time allowing layers to dry, working on other things, re-designing my Art Studio... But really he took very little time to paint at all; at least half the time that Sherlock-Wilson took. The beautiful glass and decanter belongs to my Uncle Danny. The decanter is very old and I loved the way it's slightly wibbly surface distorted the straight edge of the box, the wording, and the ellipse of the wine. Me and 'Archibald' (I Call him 'Archibald' because his name is 'Archie' and he is mostly 'bald'), seemed to gel so perfectly - just like lemon and ginger. Totally and utterly brilliant, Sandra. The way the candlelight draws out the otherwise almost invisible wallpaper. The distortion through glass of wood and lettering ... all master strokes. Your gift with calligraphy (my downfall, alas). The port decanter, gleaming... it's all there. Well worth waiting for ... another Busby Bear (hic) joins the ranks!! Well done, Sandra, I'm so glad you've hit a purple patch! I too love the way the candle illuminates the wallpaper. You certainly have found your painting niche and your happiness shows in your work. Bear nr. 4 is gorgeous, Sandra! The candle light, the beautiful decanter... fabulous! What more can I say, another masterpiece! How absolutely delightful! Love your bald Archie! And what a gorgeous decanter. The glass and the wine looks so real. The whole painting is just absolutely gorgeous. Perfect lemon and ginger. 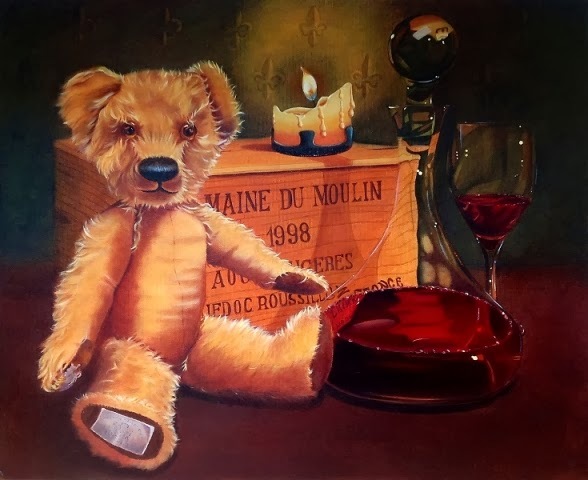 This is really cool.. All that red wine, the box through the glass, the candle, and of course the bear.. Its just so cool.. BRAVO.. I love Archibald, and the decanter and the candlelight illuminating the wallpaper. Great job! It all comes together so beautifully, like it's always been there and we've just happened upon it. Bravo! Archibald is lovely. Well done Sandra! Great job Sandra! Everything looks perfect, the bear, the candle light, the glass, the reflections.....what can I say : BRAVISSIMA!! Hugs. Thank you Kathryn! It's funny - I will have to sell Archibald (the bear) now... but I will actually miss him! How 'land of Boggle' is that?? Lol! 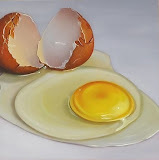 I absolutely love this painting, Sandra! Incredible glass decanter and the wine glass!!!! but best of all is this outstanding Bear!! I have to tell you,.. your post was so emotional and beautiful! When you write a book, I will be the first on line!! Congratulations of this piece!!! Ah, thanks Hilda! I've always fancied myself as a bit of a writer! Once in a while I immerse myself in a post and my husband looks at me as if to say... 'What planet are you on today?' Lol! He's adorable, and I like all of that red contrast. Lovely. love his baldness and patches ... no 4 tells another story sandra ... wonderful ! I love him!!! he's just perfect. 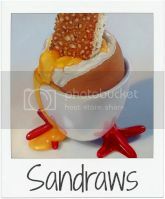 beautifully done sandra, just incredible! Oh my word Sandra - this is simply beautiful - the decanter is just fabulous! And what a truly lovely composition! I loved this post and I love that your mind takes you down very similar meandering paths of wonder and what ifs as mine does! Imagination is the best thing to be given to us freely and the thing I lament that so many children today lack because they have so much technology that they don't need to think for themselves :0/ Still, I'm not going to complain about technology because despite the bad things that the internet has brought us it has also brought us the ability to share our art and meet wonderful like minded folk that we may never otherwise have come across in our real lives! Thank you so much Nicola! Yes - these are the posts where Paul looks at me like I have completely lost the plot, lol! I keep telling him that it's a good thing to think more deeply sometimes. He's a black and white guy whereas I am multi-coloured! By the way, I think you had asked if anyone had bears for your next paintings - I did have one like that - a small one mind you - that my aunt gave me when I was about 6 (in the 70s)I think so although it's not totally antique it is still pretty ancient (hell, even the 80s is considered vintage these days! )If its still lurking around in the attic I'll happily send it to you if you need another subject? happy to discover your blog! Thank you so much Crystal! I had a feeling Archie would be your kind of bear! Sandra, I'm in awe. This is amazing. Archie is fabulous but it's the distortions through the decanter, the lettering on the box, the 'drinkability' of the red wine and the inverted reflection of the candle in the decanter stopper that really make this a masterpiece. It doesn't seem that long ago you were struggling with the decision of continuing to do things the way you were being taught, or going your own way. You made the right choice. I love your work and I love it done YOUR way. Kudos. Wow, John thank you! I love working with oils. They feel really natural to me now. Leaving my course was the best thing I ever did! That said, I really need to play with watercolour too because I haven't mastered that at all. So I'll be doing some more of that too over the next few weeks.I have a commission of a dog to do. Hmm.. I am not good at those because once again I am being told what to do. So, not sure about that one, lol! This has blown me away... it is just gorgeous and you have captured the fur so perfectly... and the wine glass as well... fantastic work!!!! The Perfect Art Studio Complete! !